released a new version of its iPhone app yesterday aimed at making it easier for individuals to exchange money with each other. 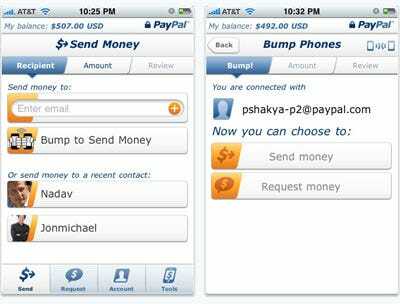 The free app lets users send or request money from their contacts. It has a feature to help groups of friends divide up restaurant checks and calculate tips. And if your friends aren’t already contacts in your phone, PayPal has integrated Bump, which lets people exchange contact info by tapping their phones together. None of this is groundbreaking stuff, but what matters is that it is all happening in PayPal’s branded app. Plenty of apps exist for doing all sorts of neat things with mobile payments, many of them using PayPal’s API. At this point, the major drawback to these apps isn’t that they aren’t good enough or easy enough to use, but simply that not enough other people are using them. Building up a critical mass of users is much easier to do with an established brand name, and in the young field of electronic payments, PayPal is as good as it gets.